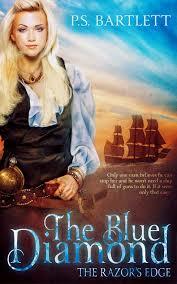 This entry was posted in Blog Tour, Historical Fiction, Pirates, Reviews, Romance, The Blue Diamond and tagged blog tour, book, book review, books, FREE BOOK, historical fiction, indie writer, Pirates, rafflecopter, review, reviews, romance, The Blue Diamond by P.S. Bartlett. Bookmark the permalink. Meet P.S. Bartlett and her exciting new book, The Blue Diamond The Razor’s Edge. A quick review about the book.